How Much Does a Ski Trip Cost? It could cost you as little as $50 per person per day. Or it could cost you four figures a day. The question is nearly impossible to give a blanket answer on, but we want to give it a try. It is so difficult to answer because a skier can make many choices that could greatly impact the cost of a trip, perhaps the biggest ones being where to ski and how to get there. We will outline three varying scenarios for a family of four below. All are realistic, and all focus on popular ski trip types. Let’s say you are a skiing family with a high income, and you want to do one trip a year and do it right. You aren’t afraid to part with some of your hard-earned money if it means that you and your family have a great time, in comfortable digs. You decide to head to an amenity-filled ski resort, like Beaver Creek or Deer Valley or Northstar-at-Tahoe. You decide to stay slopeside, because that way everyone in the family can ski as much and however they want. No meeting up in the parking lot at the end of a long day of skiing — you can cruise right to your condo or hotel. 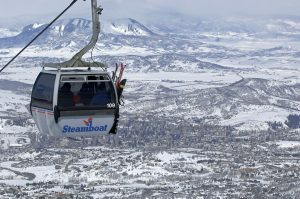 You also decide that you will just bite the bullet and buy day lift ticket passes, because you don’t want to be locked-in to a certain resort or ski pass too early in the season. Day passes cost a bit more, but let you do the trip a bit more just-in-time. You also decide to rent demo skis for everyone at the resort, so you don’t have to lug your old skis around the country. In this scenario, your 5-day trip could easily cost $10,000 plus airfare! 5 nights of slopeside lodging at $1,100 a night. $5,500. 4 lift tickets at $160 per day, for 4 days. We are going to assume that on average, people take one day off or there is one bad weather day when you don’t ski. $2,560. 5 nights of lunches on the mountain and dinners out. $225 per day, or $1,125. Ski rental, at $40 per day per person. $800. Perhaps $10,000 is a little excessive for your ski trip. We don’t blame you. Maybe you decide to go the more common option of a moderately priced trip. Something that will give you a nice trip in a great mountain destination, but not make you feel like you are losing cash at every turn. You look at various ski areas, and choose something that fits the whole family and has plenty of terrain and create comforts. A place like Big Sky or Park City, or perhaps Steamboat. Instead of paying premium price for a ski-in, ski-out place, you rent a condo that is just a short drive away from the base area. Most ski areas have free shuttle busses, or you can drive to the parking lot and walk from there. Not a big deal if you just do it once a day. The other thing you do in this scenario is look for discounts on your lift tickets, through the resort website or a place like Liftopia. The resort probably offers a package that you can purchase in advance, something like 3 of 5, or 4 of 5 days of skiing for your trip. You look for deals where the kids ski free, or at least ski for a pretty nice discount. You rent skis, but you don’t get performance skis. And you rent them off mountain, at a ski shop a couple miles from the base area. Better skis for a lower price. This scenario reduces the overall cost to $4,800 plus airfare. Still not cheap, but more reasonable. Let’s say that this vacation is all about the skiing. You do not need a nice condo to relax in at night, and you own all your gear so no rentals are needed. You choose a very nice ski area that is not quite as large or busy as the A-listers, but still gives you excellent mountain skiing. You might be thinking of a place like A-Basin, Grand Targhee, or Bridger Bowl. Lift tickets will be reduced significantly from what you would pay at a place with a marquee name. Instead of getting a condo at all, you decide to keep it simple at stay at a hotel. Not a 4-star hotel, but a perfectly nice and clean hotel a few miles from the ski area base. You don’t have the hottub or living room, but the cost saving is worth it. Still, remember you are staying near a ski area, so you are not going to get the same prices you might get in a small town in middle America. 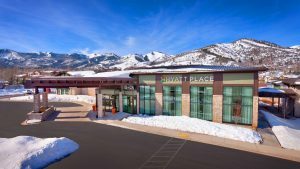 A mid-range hotel can be much less expensive than a ski condo. In this scenario, you drop the price to $2,385, or less than half the price of the moderate option. If you drive instead of fly, you might see even more savings versus the other options. You bring a big cooler, so you can keep sandwich meat and fruit (and maybe a little beer) at the ready. Instead of really eating out at all, you pack your lunch and eat dinner at cheaper spots near the hotel. $60 a day, or $300. Of course, some people will look at this and say “I can save even more money than that!”, and you can. Maybe you know someone in town who you can stay with instead of spending any money on lodging — usually the largest expense. Perhaps you invested in a season pass like the Ikon or Epic Pass, so your lift tickets will not be an additive cost. If you did, awesome. We outline 25 great ways to save money on ski trips if you need more ideas. The bottom line is that ski trips are not cheap, and unfortunately they appear to be getting more expensive. But it is not one size fits all — you can certainly tailor the trip to your specific needs.